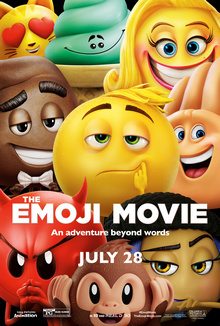 The Emoji Movie is a 2017 American computer-animated comedy film directed by Tony Leondis and written by Leondis, Eric Siegel and Mike White, based on emoji graphics used in electronic messages. The film stars the voices of T.J. Miller, James Corden, Anna Faris, Maya Rudolph, Steven Wright, Jennifer Coolidge, Christina Aguilera, Sofía Vergara, Sean Hayes and Patrick Stewart. Its story is centered on Gene (Miller), a multi-expressional emoji who lives in a teenager's smartphone and sets out on a journey to become a normal meh emoji like his parents. Produced by Sony Pictures Animation and distributed by Columbia Pictures, The Emoji Movie premiered on July 23, 2017, at the Regency Village Theatre and was theatrically released in the United States on July 28, 2017. The film grossed $217 million worldwide, but received near-universal disdain from critics and audiences alike, who lamented the script's poor attempts at humor, blatant product placement, voice performances, lack of originality and plot. It was named by several media outlets as one of the worst films of 2017. At the 38th Golden Raspberry Awards, it won in four categories: Worst Picture, Worst Director, Worst Screen Combo and Worst Screenplay, making it the first animated film to receive nominations and wins in any of those categories. Gene is an emoji that lives in Textopolis, a digital city inside the phone of his user Alex. He is the son of two meh emojis named Mel and Mary, and is able to make multiple expressions despite his parents' upbringing. His parents are hesitant of him going to work, but Gene insists so that he can feel useful. Upon receiving a text from his crush Addie, Alex decides to send her an emoji. When Gene is selected, he panics, makes a panicked expression, and wrecks the text center. Gene is called in by Smiler, a smiley emoji and leader of the text center, who concludes that Gene is a "malfunction" and therefore must be deleted. Gene is chased by bots, but is rescued by Hi-5, a once popular emoji who has since lost his fame due to lack of use. He tells Gene that he can be fixed if they find a hacker, and Hi-5 accompanies him so that he can reclaim his fame. Smiler sends more bots to look for Gene when she finds out that he has left Textopolis, as his actions have caused Alex to think that his phone needs to be fixed. Gene and Hi-5 come to a piracy app where they meet a hacker emoji named Jailbreak, who wants to reach Dropbox so that she can live in the cloud. The trio is attacked by Smiler's bots, but manage to escape into the game Candy Crush. Jailbreak reveals that Gene can be fixed in the cloud, and the group goes off into the Just Dance app. While there, Jailbreak is revealed to be a princess emoji who fled home after tiring of being stereotyped. They are once again attacked by bots, and their actions cause Alex to delete the Just Dance app. Gene and Jailbreak escape, but Hi-5 is taken along with the app and ends up in the trash. Mel and Mary go searching for Gene and have a very lethargic argument. They make up in the Instagram app when Mel reveals that he, too, is a malfunction, explaining Gene's behavior. While traveling through Spotify, Jailbreak admits that she likes Gene just the way he is, and that he should not be ashamed of his malfunction. They make it to the trash and rescue Hi-5, but are soon attacked by a bot upgraded with illegal malware. They evade it by entangling its arms and enter Dropbox, where they encounter a firewall. After many tries, the gang get past it with a password being Addie's name and make it to the cloud, where Jailbreak prepares to reprogram Gene. Gene admits his feelings for Jailbreak, but she wishes to stick to her plan of venturing into the cloud, unintentionally causing Gene to revert to his apathetic programming out of heartbreak. Suddenly, the upgraded bot sneaks into the cloud and captures Gene, prompting Hi-5 and Jailbreak to go after him with a Twitter bird summoned by Jailbreak in her princess form. As Smiler prepares to delete Gene, Mel and Mary arrive. Mel reveals to everyone that he is also a malfunction, prompting Smiler to threaten deleting him as well. Jailbreak and Hi-5 arrive and disable the bot, which falls on top of Smiler. Alex has since taken his phone to a store in hopes that a factory reset performed by technical support would restore his phone's functionality, which would entail total destruction of Gene's world should such operation complete. Out of desperation, Gene prepares to have himself texted to Addie, making numerous faces to express himself. Realizing that Addie received a text from him, Alex cancels the factory reset just as it nearly finishes, saving the emoji and finally getting to speak with Addie, who likes the emoji Alex sent. Gene accepts himself for who he is and is celebrated by all of the emojis. In a mid-credits scene, Smiler has been relegated to the "loser lounge" with the other unused and forgotten emojis for her crimes, wearing numerous braces due to her teeth being cracked by the bot, and playing and losing a game of Go Fish. Maya Rudolph as Smiler, a smiley emoji. As the original emoji, she is the systems supervisor of the text center. Liam Aiken as Ronnie Ramtech, one of the two programmers that select which Emoji to display on a phone. The film was inspired by director Tony Leondis' love of Toy Story. Wanting to make a new take on the concept, he began asking himself, "What is the new toy out there that hasn't been explored?" At the same time, Leondis received a text message with an emoji, which helped him realize that this was the world he wanted to explore. In fleshing out the story, Leondis considered having the emojis visit the real world. However, his producer felt that the world inside a phone was much more interesting, which inspired Leondis to create the story of where and how the emojis lived. As Leondis is gay, he connected to Gene's plight of "being different in a world that expects you to be one thing," and in eventually realizing that the feeling held true for most people, Leondis has said the film "was very personal". In July 2015, it was announced that Sony Pictures Animation had won the bidding war against Warner Bros. and Paramount Pictures over production rights to make the film, with the official announcement occurring at the 2016 CinemaCon. The film was fast tracked into production by the studio after the bidding war. Unlike most other animated films, the film had a production time of 2 years, as there were concerns that the movie would become outdated due to the evolution of phone technology. On World Emoji Day on July 17, 2016, Miller was announced as the lead. Leondis created the part with Miller in mind, although the actor was initially hesitant to play the role, only accepting after Leondis briefed him on the story. Leondis chose Miller because "when you think of irrepressible, you think of TJ. But he also has this surprising ability to break your heart". in addition Miller also contributed some re-writes. In October 2016, it was announced that Ilana Glazer and Corden would join the cast as well. Glazer was later replaced by Anna Faris. According to Jordan Peele, he was initially offered the role of "Poop", which he would go on to state led to his decision to retire from acting. The part would ultimately go to Patrick Stewart. The film's score was composed by Patrick Doyle, who previously composed the score for Leondis' 2008 film Igor. Singer Ricky Reed recorded an original song, "Good Vibrations", for the film. In November 2015, Sony scheduled the film to be released on August 11, 2017. A year later, it was moved to August 4, 2017, with Baby Driver initially taking its previous date. In late March 2017, the film was moved one week earlier, to July 28, 2017, switching places with Sony Pictures' The Dark Tower. The film's theatrical release is preceded by Puppy!, a Hotel Transylvania short written and directed by Genndy Tartakovsky. On December 20, 2016, a teaser trailer for the film was released, which received widely harsh criticism from social media users, collecting almost 22,000 "dislikes" against 4,000 "likes" within 24 hours of its release. A second trailer was later released on May 16, 2017 which is also panned as well. Sony promoted the release of the latter trailer by hosting a press conference in Cannes, the day before the 2017 Cannes Film Festival, which featured T. J. Miller parasailing in. Variety called the event "slightly awkward", and The Hollywood Reporter described it as "promotional ridiculousness". Sony Pictures was later criticized after the film's official Twitter account posted a promotional picture of a parody of The Handmaid's Tale, featuring Smiler. The parody was considered to be "tasteless" due to the overall themes of the work, and the image was deleted afterward. On July 17, 2017, the Empire State Building was lit “emoji yellow” with Patrick Stewart, Maya Rudolph and Jake T. Austin attending the ceremony alongside Girls Who Code and World Emoji Day creator Jeremy Burge. On the same day, director Tony Leondis and producer Michelle Raimo Kouyate joined Jeremy Burge and Jake T. Austin to ring the closing bell of the New York Stock Exchange and Saks Fifth Avenue hosted a promotional emoji red carpet event at the Saks New York flagship store to promote branded Emoji Movie merchandise. On July 20, 2017, Sony Pictures invited YouTuber Jacksfilms (whom they considered "the [No. 1] fan of the Emoji Movie") to the world premiere three days later and sent him a package containing various Emoji Movie memorabilia including fidget spinners, face masks, and a plushie of the poop emoji. Jacksfilms had praised the movie for months prior, although it was sarcasm and he was actually making fun of the movie. The film's release was also preceded by a tie-in mobile game, titled POP FRENZY! The Emoji Movie Game, a free-to-play bubble shooter game that was released on iOS and Android, with optional in app purchases. The Emoji Movie was released on Blu-ray and DVD on October 24, 2017, by Sony Pictures Home Entertainment. The Emoji Movie grossed $86.1 million in the United States and Canada and $131.7 million in other territories, for a worldwide total of $217.8 million, against a production budget of $50 million. In the United States and Canada, The Emoji Movie was released alongside Atomic Blonde, and was projected to gross around $20 million from 4,075 theaters in its opening weekend. The film made $900,000 from Thursday night previews and $10.1 million on its first day. It went on to debut to $24.5 million, finishing second at the box office behind Dunkirk. It held the record for the worst opening for a film in over 4,000 theaters, until it was surpassed two weeks later by The Nut Job 2: Nutty by Nature, which had an opening of $8.3 million from 4,003 theaters. In the film's second weekend, it dropped by nearly 50%, grossing $12.4 million and finishing in 3rd (behind The Dark Tower and Dunkirk). Review embargoes for the film were lifted midday July 27, only a few hours before the film premiered to the general public, in a move considered among one of several tactics studios are using to try to curb bad Rotten Tomatoes ratings. Speaking of the effect embargoing reviews until last minute had on the film's debut, Josh Greenstein, Sony Pictures president of worldwide marketing and distribution, said, "The Emoji Movie was built for people under 18 ... so we wanted to give the movie its best chance. What other wide release with a score under 8 percent has opened north of $20 million? I don't think there is one." The Emoji Movie was widely panned by critics and audiences alike. Several major outlets called it one of the worst films of 2017. On review aggregator website Rotten Tomatoes, the film holds an approval rating of 7% based on 123 reviews, with an average rating of 2.65/10. The site's critical consensus displays a no symbol emoji ("🚫") in place of text. On Metacritic, which assigns a normalized rating to reviews, the film has a weighted average score of 12 out of 100, based on 26 critics, indicating "overwhelming dislike", and making it the lowest rated animated film of all time on the site. Audiences polled by CinemaScore gave the film an average grade of "B" on an A+ to F scale. David Ehrlich of IndieWire gave the film a D, writing: "Make no mistake, The Emoji Movie is very, very, very bad (we're talking about a hyperactive piece of corporate propaganda in which Spotify saves the world and Sir Patrick Stewart voices a living turd), but real life is just too hard to compete with right now." Alonso Duralde of TheWrap was also critical of the film, calling it "a soul-crushing disaster because it lacks humor, wit, ideas, visual style, compelling performances, a point of view or any other distinguishing characteristic that would make it anything but a complete waste of your time". Glen Kenny of The New York Times described the film as "nakedly idiotic", stating that the film plays off a Hollywood idea that the "panderingly, trendily idiotic can be made to seem less so". Owen Gleiberman of Variety lambasted the film as "hectic situational overkill" and "lazy" while viciously criticizing the film, writing: "There have been worse ideas, but in this case the execution isn't good enough to bring the notion of an emoji movie to funky, surprising life." Writing in The Guardian, Charles Bramesco called the film "insidious evil" and wrote that it was little more than an exercise in advertising smartphone downloads to children. Writing for the Hindustan Times, Aditya Dogra acknowledged that viewers had noticed the similarities of The Emoji Movie to Inside Out, The Lego Movie, and Wreck-It Ralph. ^ "The Emoji Movie (U)". British Board of Film Classification. Archived from the original on July 28, 2017. Retrieved July 24, 2017. ^ Pressburg, Matt (July 17, 2017). "Why Sony, LStar Movie Finance Deal Fell Apart: Flops, 'Ghostbusters' and Feet on Desk (Exclusive)". TheWrap. Archived from the original on July 18, 2017. Retrieved July 19, 2017. ^ a b "The Emoji Movie (2017)". Box Office Mojo. Retrieved April 17, 2018. ^ Goldberg, Matt (December 20, 2016). "'The Emoji Movie' Trailer Literally Gets Promoted by 'Meh'". Collider. Archived from the original on December 21, 2016. Retrieved December 20, 2016. ^ Amidi, Amid (October 10, 2016). "'Emojimovie: Express Yourself' Promises To Make You A Better Person". Cartoon Brew. Archived from the original on November 24, 2016. Retrieved November 20, 2016. ^ Lee, Ashley (October 10, 2016). "James Corden, Ilana Glazer Join Animated 'EmojiMovie'". The Hollywood Reporter. Archived from the original on November 29, 2016. Retrieved November 20, 2016. ^ Franklin, Garth. ""Dark Tower" & "Emoji Movie" Swap Dates - Dark Horizons". www.darkhorizons.com. Retrieved April 23, 2017. ^ Pulver, Andrew (January 22, 2018). "Razzies 2018 – Transformers: The Last Knight leads worst films nominations". the Guardian. ^ "RAZZIE AWARD NOMINATIONS ANNOUNCED". Rotten Tomatoes. January 21, 2018. Retrieved January 21, 2018. ^ "38TH Razzie Award Winners! - YouTube". www.youtube.com. ^ a b c d Goldberg, Matt (December 20, 2016). "'The Emoji Movie' Trailer Literally Gets Promoted by 'Meh'". Collider. Archived from the original on December 21, 2016. Retrieved December 20, 2016. ^ a b Snierson, Dan (July 17, 2016). "Silicon Valley star T.J. Miller to voice lead character in emoji movie". Entertainment Weekly. Archived from the original on July 18, 2016. ^ a b Lee, Ashley (October 10, 2016). "James Corden, Ilana Glazer Join Animated 'EmojiMovie'". The Hollywood Reporter. Archived from the original on November 29, 2016. Retrieved November 20, 2016. ^ a b Amidi, Amid (October 10, 2016). "'Emojimovie: Express Yourself' Promises To Make You A Better Person". Cartoon Brew. Archived from the original on November 24, 2016. Retrieved November 20, 2016. ^ a b c Schager, Nick (April 20, 2017). "'The Emoji Movie': Meet James Corden's High-Spirited, High-Fiving Character". Yahoo! Movies. Archived from the original on April 25, 2017. Retrieved April 26, 2017. ^ a b c Shaw-Williams, Hannah (January 18, 2017). "Sir Patrick Stewart Voicing Poop Emoji in The Emoji Movie". Screen Rant. Archived from the original on January 19, 2017. ^ Giardina, Carolyn (January 18, 2017). "Patrick Stewart to Voice Poop Emoji in 'Emoji Movie'". The Hollywood Reporter. Archived from the original on January 28, 2017. Retrieved January 25, 2017. ^ "Meet Christina Aguilera's 'Emoji Movie' Character: First Pic!". Archived from the original on May 16, 2017. ^ Miller, Mike (April 18, 2017). "Meet Sofia Vergara's Flamenco Dancer from The Emoji Movie: 'People Are Always Saying I Look Like Her!". People. Archived from the original on April 19, 2017. Retrieved April 18, 2017. ^ "The EMOJI Movie (Sony Pictures) Sean Hayes - Devil". YouTube. July 18, 2017. Archived from the original on August 19, 2017. Retrieved July 19, 2017. ^ Everett, Christina (July 28, 2017). "See the Voices Behind the Emoji Movie Characters". Entertainment Weekly. Archived from the original on July 30, 2017. Retrieved July 30, 2017. ^ a b Gleiberman, Owen (July 27, 2017). "Film Review: 'The Emoji Movie'". Variety. Archived from the original on July 29, 2017. Retrieved July 29, 2017. ^ a b "The Emoji Movie' Review: There Are No Words". TheWrap. July 27, 2017. Archived from the original on July 27, 2017. ^ Marnell, Blair (December 20, 2016). "THE EMOJI MOVIE TEASER TRAILER ARRIVES WITH A 'MEH' AND A POOP DADDY". The Nerdist. Archived from the original on December 30, 2016. ^ a b c d Frreeman, Molly. "How Toy Story Inspired The Emoji Movie, According to Tony Leondis". Screenrant. Archived from the original on July 12, 2017. Retrieved July 14, 2017. ^ Fleming Jr, Mike (July 21, 2015). "Emoji At Center Of Bidding Battle Won By Sony Animation; Anthony Leondis To Direct". Deadline. Archived from the original on December 10, 2015. Retrieved December 23, 2015. ^ Chipman, Bob (April 13, 2016). "Emoji Movie Officially Announced by Sony; Plot Details Revealed". Screen Rant. Archived from the original on April 16, 2016. Retrieved April 16, 2016. ^ Evry, Max (July 10, 2017). "CS Interviews: Emoji Movie Director Tony Leondis". ComingSoon.net. Retrieved January 27, 2018. ^ a b Gaudette, Emily. "How the 'Emoji Movie' Tries to Transcend Capitalism". Inverse. Archived from the original on July 13, 2017. Retrieved July 14, 2017. ^ Roman, Julian (July 11, 2017). "T.J. Miller and Emoji Movie Director Talk Poop Jokes & Hard Laughs". MovieWeb. Retrieved October 7, 2017. ^ Ivie, Devon. "We Can Officially Blame The Emoji Movie for Jordan Peele's Acting Retirement". Vulture. Retrieved 5 February 2018. ^ "'The Emoji Movie' to Feature Original Song by Ricky Reed". Film Music Reporter. July 20, 2017. Archived from the original on July 28, 2017. Retrieved July 22, 2017. ^ "The Emoji Movie (2017)" – via www.imdb.com. ^ Perry, Spencer (December 22, 2015). "Emoji Movie, Animated Spider-Man and Peter Rabbit Get Release Dates". ComingSoon.net. Archived from the original on December 23, 2015. Retrieved December 23, 2015. ^ Hipes, Patrick (November 3, 2016). "'The Dark Tower' Release Date Moved Into Summer 2017, 'Jumanji' Shifts To Christmas As Sony Juggles Slate". Deadline. Archived from the original on November 8, 2016. Retrieved November 20, 2016. ^ "The Dark Tower Movie Delayed". Comingsoon.net. Archived from the original on November 4, 2016. ^ "Sony Pictures Animation Unveils 'Spider-Man,' 'Hotel Transylvania 3,' 'Smurfs' And More". January 19, 2017. Archived from the original on January 22, 2017. Retrieved January 20, 2017. ^ "Sony Pictures Animation Teases Upcoming Slate". January 18, 2017. Archived from the original on January 19, 2017. Retrieved January 20, 2017. ^ Reilly, Nicholas (December 20, 2016). "The first trailer for The Emoji Movie is here and people are already hating it". Metro. Retrieved November 6, 2018. ^ Kitchener, Shaun (December 21, 2016). "'Worst idea ever' The Emoji Movie releases first trailer… and is PANNED by viewers". Daily Express. Retrieved November 6, 2018. ^ Plante, Chris (May 16, 2017). "The Emoji Movie's first trailer is 150 seconds of kids' movie cliches". The Verge. Vox Media. Archived from the original on May 17, 2017. ^ "Sony's first full trailer for The Emoji Movie will make you rethink your life". Archived from the original on May 17, 2017. ^ a b Brzeski, Patrick. "T.J. Miller Parasails Into Cannes in Stunt for Sony's 'Emoji Movie'". The Hollywood Reporter. Archived from the original on July 31, 2017. Retrieved July 14, 2017. ^ Nyreni, Erin. "T.J. Miller Parasails Into Cannes to Debut 'Emoji Movie' Trailer". Variety. Archived from the original on July 29, 2017. Retrieved July 14, 2017. ^ Alexander, Julia (July 25, 2017). "Sony deletes questionable Emoji Movie tweet parodying The Handmaid's Tale". Polygon. Archived from the original on July 25, 2017. Retrieved July 25, 2017. ^ Huff, Lauren (July 24, 2017). "'Emoji Movie' Criticized for "Tasteless" 'Handmaid's Tale' Tweet". The Hollywood Reporter. Archived from the original on July 25, 2017. Retrieved July 26, 2017. ^ Hern, Alex (2017-07-17). "Apple marks World Emoji Day with beards, headscarves and breastfeeding". The Guardian. ISSN 0261-3077. Retrieved 2019-02-17. ^ Hung, Wendy (2017-07-18). "How The Empire State Building Glowed For World Emoji Day". Jetset Times | Catalog of Cool Places. Retrieved 2019-02-17. ^ "Cast From The Emoji Movie Celebrates World Emoji Day At Empire State Building Stock Photos and Pictures | Getty Images". www.gettyimages.com. Retrieved 2019-02-17. ^ Sequin, Molly. "The Empire State Building will light up 'emoji yellow' for World Emoji Day". Mashable. Retrieved 2019-02-17. ^ "The Cast Of The Emoji Movie Rings The Closing Bell Of The New York Stock Exchange In Honor Of World Emoji Day Stock Photos and Pictures | Getty Images". www.gettyimages.com. Retrieved 2019-02-17. ^ "Sony's The Emoji Movie (NYSE: SNE) Rings The NYSE Closing Bell®". New York Stock Exchange. Retrieved 2019-02-17. ^ "Saks Celebrates World Emoji Day Stock Photos and Pictures | Getty Images". www.gettyimages.com. Retrieved 2019-02-17. ^ Lockwood, Lisa. "Saks Fifth Avenue, Sony team up for 'The Emoji Movie' merchandise". latimes.com. Retrieved 2019-02-17. ^ "Emojis Get a High-Fashion Makeover at Saks Fifth Avenue". www.yahoo.com. Retrieved 2019-02-17. ^ "JacksFilms Got The Best Response After Trolling The Sh*t Out Of 'The Emoji Movie'". We The Unicorns. Retrieved 2019-02-04. ^ "Apple App Store listing for POP FRENZY! The Emoji Movie Game". Apple App Store. Retrieved 12 August 2018. ^ "Google Play Store listing for POP FRENZY! The Emoji Movie Game". Google Play. Retrieved 12 August 2018. ^ "The Emoji Movie (2017)". DVDs Release Dates. August 24, 2017. Retrieved August 24, 2017. ^ "Will 'Dunkirk' Stay Afloat Against 'Atomic Blonde,' 'Emoji Movie' at Box Office This Weekend?". TheWrap. July 25, 2017. Archived from the original on July 25, 2017. Retrieved July 26, 2017. ^ "Atomic Blonde' Delivers $1.52M in Thursday Previews; 'Emoji' with $900k". Box Office Mojo. July 28, 2017. Archived from the original on July 28, 2017. ^ a b "'Dunkirk' Marches Ahead Of 'Emoji Movie' For Top Spot With $28M+". Deadline Hollywood. Archived from the original on July 30, 2017. Retrieved July 30, 2017. ^ Amidi, Amid (August 13, 2017). "'The Nut Job 2' Records Worst All-Time Opening For A Film In 4,000+ Theaters". Cartoon Brew. Retrieved April 7, 2018. ^ "'The Dark Tower' Opens To $18M+ In Diverse Marketplace: Was The Decade-Plus Battle To The Screen Worth It?". Deadline Hollywood. Archived from the original on August 4, 2017. Retrieved August 5, 2017. ^ a b "Studios Fight Back Against Withering Rotten Tomatoes Scores". The Hollywood Reporter. August 2, 2017. Archived from the original on August 3, 2017. Retrieved August 3, 2017. ^ "7 brutal reviews of The Emoji Movie". Entertainment Weekly. July 27, 2017. Archived from the original on July 27, 2017. ^ "'The Emoji Movie': What the Critics Are Saying". The Hollywood Reporter. July 27, 2017. Archived from the original on July 28, 2017. ^ "Critics Are Absolutely Slating 'the Emoji Movie'". Highsnobiety. August 1, 2017. Archived from the original on August 1, 2017. Retrieved August 1, 2017. ^ "Sad face: Emoji Movie 'worst of 2017'". BBC News. 2018-03-03. Retrieved 2018-03-03. ^ "The Emoji Movie (2017)". Rotten Tomatoes. Fandango. Archived from the original on July 27, 2017. Retrieved March 28, 2019. ^ "The Emoji Movie reviews". Metacritic. Archived from the original on July 22, 2017. Retrieved July 30, 2017. ^ David Ehrlich (July 27, 2017). "Review: 'The Emoji Movie' Is Almost as Bad and Brutally Depressing as Everything Else in 2017". IndieWire. Archived from the original on July 28, 2017. Retrieved July 27, 2017. ^ Kenny, Glenn (July 27, 2017). "Review: 'The Emoji Movie' Is Here. No, We're Not Making This Up". The New York Times. Archived from the original on July 28, 2017. Retrieved July 27, 2017. ^ Bramesco, Charles (27 July 2017). "The Emoji Movie review – a big thumbs down 👎". The Guardian. Archived from the original on 29 July 2017. Retrieved 29 July 2017. ^ Dogra, Aditya (May 17, 2017). "The Emoji Movie: Trailer manages to divide the internet within hours of releasing". Hindustan Times. Retrieved March 3, 2018. Wikimedia Commons has media related to The Emoji Movie.